This page is written by the game's inventor, Jose Carrillo. Modern English Random Chess (MERC) is a 10x10 variant inspired by applying the 'Modern' principles to English Random Chess. Benjamin Clark originally proposed English Random Chess in 2004. Simply stated English Random Chess is a variant played with the pieces of a standard chess set, on a Polish or International Draughts (Checkers) 10x10 board (below right). 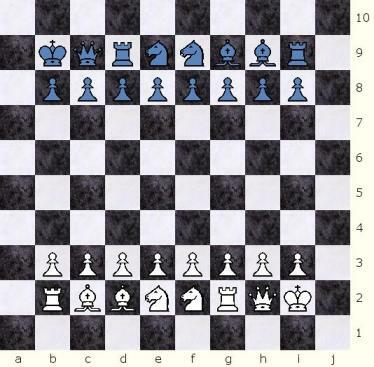 There are no restrictions in ERC regarding the random placement of the pieces behind the pawns, any combination is valid, and there is no symmetry between the two sides. Each side has their own random setup. There are 5,040 possible setups per side and 25,401,600 possible different games that can be played (5,040 x 5,040). Castling is possible, provided the random position allows it (i.e. the King starts between the rooks), and Bishops can be on the same color squares. In the sample English Random Chess position above Black is able to castle (but White is not), and White has both Bishops on the light color squares. In Modern English Random Chess there are also no restrictions regarding the random placement of the pieces behind the pawns, any combination is valid, but there is reverse symmetry between the two sides. Symmetric Castling is possible in MERC, provided the random position allows it (i.e. the King starts between the rooks). The Bishops can be on the same color squares and like the other Modern variants, MERC has the Bishop Adjustment Rule to allow players to move a Bishop to the opposite color squares in those random positions where both Bishops start on the same color squares. Modern English Random Chess has the 5,040 different possible reverse symmetric starting setups. 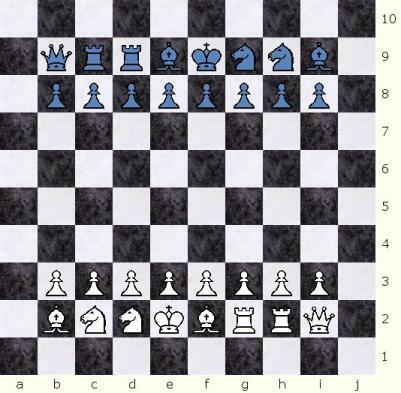 The pawns are placed on the players 3rd rank, with the pieces randomly placed behind the pawns. There are no men on the first and last files or ranks. All pieces are randomly placed in the players' second rank, without any restrictions. It is possible for both Bishops to be on the same color squares (dark or light squares). The King may be or not between the two rooks. In those positions where the King starts between the rooks, symmetric castling is allowed. There are 5,040 different legal starting positions in Modern English Random Chess. There is a Bishop Adjustment rule that is in effect only in games when both Bishops start on the same color squares in the initial random setup. This rule allows players to move one of the Bishops to the opposite color, if they so desire. The opponentsâ€™ pieces are placed with reverse symmetry (Whiteâ€™s piece at b2 is equivalent to Blackâ€™s i9, Whiteâ€™s c2 to Blackâ€™s h9, Whiteâ€™s d2 to Blackâ€™s g9, Whiteâ€™s e2 to Blackâ€™s f9, and so onâ€¦). 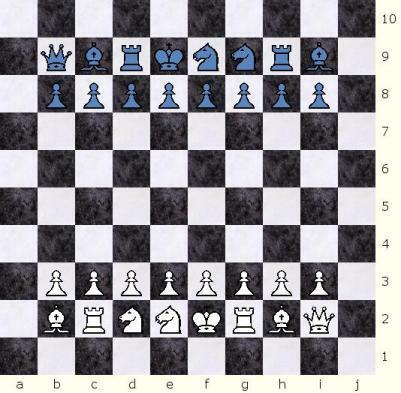 Both White and Black players have the same view of the board, both of their own pieces, as well as for the enemy army. Orthodox Chess pieces are exclusively used. Orthodox Chess rules apply when applicable. Modified Castling rules are below, as well as the new Bishop Adjustment Rule. Pawn promotion takes place when pawns reach their 10th rank. The Modern English Random Chess castling rules are based in the Fischer Random Chess rules. Double-move castling: By on one turn making a move with the king and a move with the rook. Transposition castling: By transposing the position of the king and the rook. 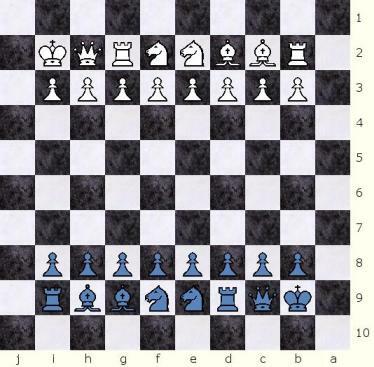 King-move-only castling: By making only a move with the king. Castling the King and Rook will be placed as if the player had castled short in Orthodox Chess, both to either side of the board. There is no long castling (O-O-O) in MERC. Thus, after c-castling (notated as O-Oc), the King is on the c-square (c2 for White and c9 for Black) and the Rook is on the d-square (d2 for White and d9 for Black). After h-castling (notated as O-Oh), the King is on the h-square (h2 for White and h9 for Black) and the Rook is on the g-square (g2 for White and g9 for Black). h-castling (O-Oh) is identical to Ortodox Chess short castling (O-O). This table shows where the King and Rook end up and the notation for each type of castling. Unmoved: The King and the castling Rook must not have moved before in the game, including a previous castling or a Bishop Adjustment. Un-attacked: All of the squares between the king's initial and final squares (including the initial and final squares) must not be under attack by any opposing piece. Vacant: All the squares between the king's initial and final squares (including the final square), and all of the squares between the rook's initial and final squares (including the final square), must be vacant except for the king and castling rook. A player may castle at most once in a game. If a player moves his king or both of his initial rooks without castling, he may not castle during the rest of the game. The king cannot move through check. The king cannot jump over his own rook if and when said rook stands on a â€œcheckedâ€ square. This point is best ilustrated by the sample Fischer Random Chess (Chess960) position below where it's illegal for White to g-castle (O-O) with it's e-Rook, as the King would need to jump over an attacked square. Even though the e-square is occupied by a Rook, it is under attack (or 'checked') by Black's Rook on e8. A King that has swapped places with a Bishop according to the Bishop Adjustment rule can no longer do castling for the rest of the game. A Rook that has swapped places with a Bishop according to the Bishop Adjustment rule can no longer castle with the King. Castling in MERC is symmetric to either side of the board. MERC Castling is like the Orthodox short castling (O-O) but to either side. In those positions where the Bishops start up in the same color squares (either both on dark or light squares), players on their turn, are allowed to convert one (and only one) of their Bishops to the opposite color square by swapping places with any piece adjacent to them. Neither the Bishop nor the piece to be adjusted with may have moved before the Bishop swap. The Bishop adjustment will count as a single turn, and a move for both the Bishop and the piece swapped with. The Bishop Adjustment Rule is optional, and a player is not forced to use it. A player may choose to play with his Bishops on the same color squares if he so desires, even if his opponent chooses to adjust one of his Bishops. A Bishop on a corner may only adjust with the one piece adjacent to it. The Bishop is allowed to swap places with a Knight, the Queen, a Rook, and also with the King! If the Bishop Adjusts with a Rook, that rook will be considered to have moved, and King Castling with that rook will no longer be possible. King Castling with the other Rook will still be possible provided neither the second Rook nor the King have moved. If the Bishop Adjusts with the King, the King will be considered to have moved, and King Castling will no longer be available for the rest of the game. When adjusting with the King, the Bishop Adjustment is considered to be a â€œBishopâ€ move, and not a King move that enables a player to move out of check. If the King is in check, it is not legal to move out of check with a Bishop Adjustment. To see actual games that have been played on-line, follow the link above. Modern English Random Chess (MERC) was created by JosÃ© Manuel Carrillo-MuÃ±iz, from Puerto Rico in 2008.